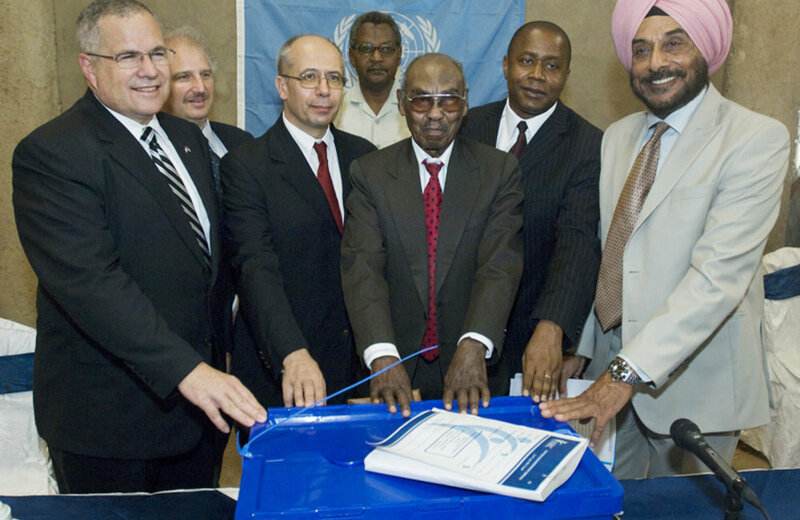 UNMIS wound up its operations on 9 July 2011 with the completion of the interim period agreed on by the Government of Sudan and Sudan People’s Liberation Movement in the Comprehensive Peace Agreement (CPA), signed on 9 January 2005. 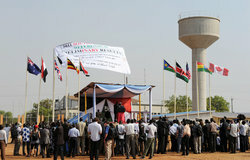 The mission ended its six years of mandated operations the same day South Sudan declared independence, following a CPA-provided referendum on 9 January 2011 that voted overwhelmingly in favour of secession. In support of the new nation, the Security Council established a successor mission to UNMIS – the UN Mission in South Sudan (UNMISS) – on 9 July for an initial period of one year, with the intention to renew for further periods as required. Southern Sudan Referendum Commission announcing preliminary results for region's referendum, which wereoverwhelmingly in favour of secession from the north, on 30 January. Photos: UNMIS/Tim McKulka. Southern Sudanese displaced persons returning from Darfur to their places of origin in the wake of the region's historic referendum on whether to remain united with the north or become a separate nation. Photos: UNMIS/Paul Banks. 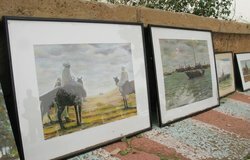 Artists gathering in Khartoum on 15 January to launch artwork on the Nile as an expression of solidarity and artistic freedom. Photos: UNMIS/Eszter Farkas. 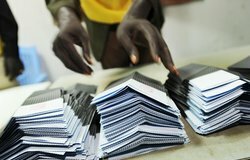 Ballots being sorted and counted by polling center workers in presence of election observers at Salva Kirr School voting center in Aweil, Northern Bahr El-Ghazal State, on 14 January. Photos: UNMIS/Paul Banks. 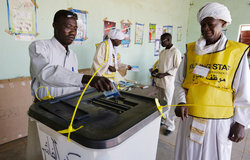 Voting in Khartoum in the historic Southern Sudan referendum, which will determine whether the region remains united with the north or secedes. The ballot is taking place from the 9 to 14 January. 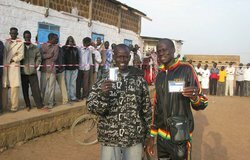 Voting in Juba. Photos: UNMIS/Tim McKulka. 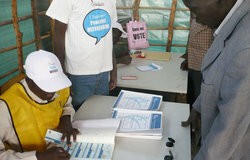 Voting in Darfur. Voting in Aweil. 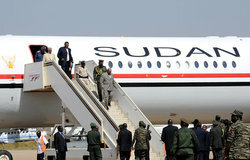 Visit of Sudanese President Omar Al-Bashir to the Southern Sudanese capital of Juba on 4 January, five days before the region's self-determination referendum. Photos: UNMIS/Tim McKulka. 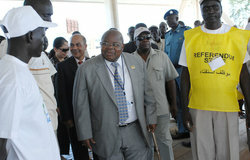 UNSG Panel Chair Benjamin Mkapa meeting with Government of Southern Sudan President Salva Kiir Mayardit, registration staff and the media on the second day of voter registration for the Southern Sudan referendum, scheduled fro 9 January 2011.Photos: UNMIS/Tim McKulka. 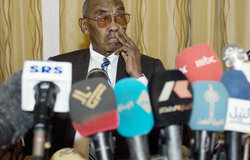 Launch of SSRC media campaign in Rotana Hotel in Khartoum on 7 November.Photos:UNMIS/Paul Banks. UNMIS giving media training for SSRC in Khartoum during first week of November.Photos: UNMIS/Paul Banks. 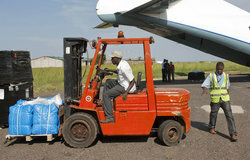 Southern Sudan referendum materials for state committees and county offices being unloaded at Juba airport at end of October for dispatch to 10 southern states.Photos: UNMIS/Tim McKulka and Pual Banks. 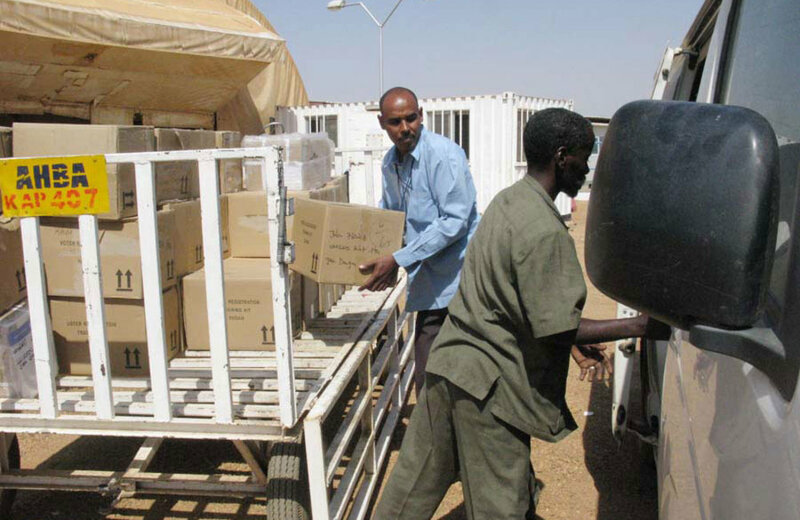 Referendum registration kits being packed for transport to SSRC warehouse in Khartoum at end of October.Photos: UNMIS/Paul Banks. 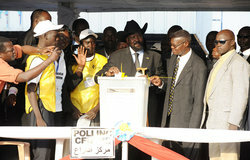 Handover of referendum registration kits and books on 30 October in Khartoum.Photos: UNMIS/Paul Banks.